Here’s a couple of fun things to do with your newspaper to liven up the romance during any old boring week! Feature your spouse on the front page. I created a "Husband of the Year" theme and wrote an "article" about how wonderful he was using tid-bits that I may not tell him very often. It was a sneaky way to express my appreciation! 1. 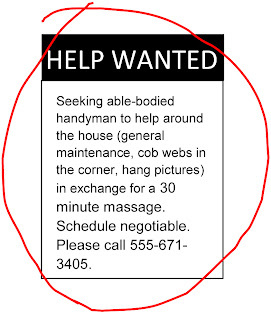 Help Wanted Ad - (shown above) This is a creative way to ask your handyman to help around the house without nagging...you get some things done that have been waiting, and he gets a massage (or any other "currency" you choose to compensate him with). Win-Win! 3. Job Needed - "good looking woman looking for a temporary personal assistant position. previous experience/skills: experienced masseuse, recommended personal chef, etc. (insert your skills here)." Hopefully, your spouse will get that you are offering to be HIS personal assistant for night/day/whatever. So, these type of things are all about the wording--so get creative, look at real classified ads and design an ad that your husband (OR WIFE...I know it's mainly women who follow this site, but I certainly am not discriminating the men. In fact, I encourage them to visit! )...anyway, hopefully THEY will get a kick out of any ad or article you put in the classifieds. Okay, all you brilliant lovers...what else would you do to create a little romance with your newspaper? Oh those are some good ideas. My hubby actually took out an real ad for me on our first wedding anniversary. It was so romantic. Just stopped by from SITS and wanted to welcome you. Those are very cute ideas. I love it! Those are great ideas! I'm so not creative.